This giant case of rimfire ammunition from Federal is a great choice for all your target shooting needs. 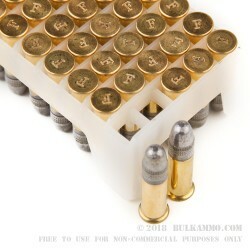 Each case of 5000 contains 10 "bricks" of 500 rounds each; each "brick" in turn contains 10 boxes of 50 rounds apiece. That's a lot of ammo to burn through! 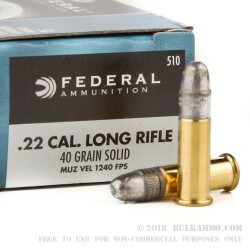 These cartridges fire a 40 grain lead round nose bullet and fall into the "high velocity" category, producing a muzzle velocity of 1,240 feet per second. They are perfect for target practice, marksmanship training, and plinking. Federal rimfire ammunition is loaded in Anoka, Minnesota using rimfire-primed brass cases. I am a new gun owner and bought a Ruger 22/45 as my first purchase. I wanted something that I could shoot a lot for little money. This ammo fits the need. I went shooting today and shot 250 rounds with 3 FTE and zero FTF. How does this ammo stack up to the other more expensive ammo? I have no idea. What I do know is that when I shoot at a target with the gun supported I get pretty nice groups. Love the Ammo and the Value!! Q: What exactly is fouling? And how can I counteract it, or clean a gun that has fouling? A: Fouling is a term used to describe the buildup of carbon, lead, or copper on or in various parts of the firearm. Counteracting it is difficult beyond using copper plated or washed bullets, but removing it can be accomplished with bore brushes, cleaning patches, and various cleaning agents such as foaming bore cleaners and CLP (Clean, Lubricate, Protect) type oils. Q: Will lead bullet leave more fouling? I tend to shoot well over 300 hundred rounds per range visit. Thanks. A: Yes, the lead projectiles in this Federal ammo, which do not have a copper plating, will cause slightly more fouling. If you shoot a huge amount of 22LR, you might wish to use copper washed or copper plated bullets to reduce fouling. Q: What is the difference in "standard" and "high" velocity in the .22LR? A: Standard velocity ammo has a muzzle velocity of approximately 1080fps, while high velocity ammo has a muzzle velocity of approximately 1250fps. Q: Do you have any hollowpoint 40gr 22lr ammo in bulk? Thanks! A: Yes, we have copper plated and copper washed hollow point 22LR ammo in stock, from CCI, Federal, and Remington. Most of our 22LR HPs are in the 36gr bullet weight. 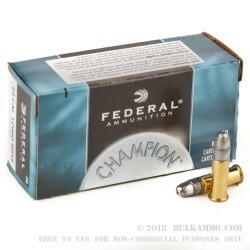 Posted On: 9/27/11 By: Clark Hogan Jr.
A: Federal's Champion 22LR is their value-oriented line. This product in particular is intended for shooters who want to stock up on 22LR ammo or who do a lot of training/shooting with 22 ammo. It is not intended for target/match or hunting purposes. Other types of Federal 22LR ammo may be better for those purposes.